We ship Body paint and Make up products worldwide. We also carrie 8 shades of Magic Stardust which is great for application over liquid latex to get that shimmering look. To make ordering fast and easy, we provide a variety of kits including starter kits and team spirit kits that have everything you need to create a design. You create the kits by picking your favorite colors. You can view our body paint and stardust color palettes to help you choose your colors. ONLY here you can find AMMONIA-FREE liquid latex that is made with FDA approved ingredients making it safe for face and body painting! We offer over 30 standard colors including metallic and glow in the dark fluorescent colors and have the ability to match any color you need. In addition we have a full array of accessories including exclusive preparation, clean and finishing polish products. 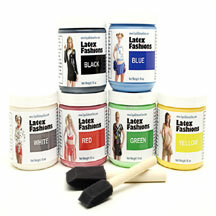 You can find fashion tape and all the brushes and rollers you will need to design that one of a kind outfit. We now have fashionable skirts and mini skirts available for purchase! They can be bought individually or with our costume kits. Available in small through large sizes and in several different colors/patterns to choose from to match your personal fashion style today! We offer NCAA body painting product kits. Our Ammonia Free Liquid Latex comes in many of your favorite team colors, find yours today! Whether you are looking for ACC, BIG 10, BIG 12, PAC 10, or SEC colors we have it all and can even customize to your own team if not available (BIG EAST colors coming soon!). For those that will be tailgating at an NFL game, we have your team spirit colors too! Buy your products today and have it in time for the big game! For new products and offers as we are constantly brainstorming and coming up with new ideas to better serve you! Our latex is made with FDA approved ingredients and we are the only company to carry AMMONIA FREE liquid latex paints. Our body paints will not stain the skin and the color will not rub off onto your clothing or furniture like others. Used correctly with our Prep and Clean products, our paints will not stick to body hair and you can wear it under clothing, and allows for easy removal. Our paints will not sweat off like grease paint. Our paints will last for hours of fun! Our latex formulation uses cosmetic grade materials which offer the highest quality available in the market. This product is great for designing tattoos, costumes and unique outfits, all it takes is a little imagination to create anything! Our products are sold to theater companies, make up artists and night clubs. Cirque Du Soleil uses our product for their performances!